Malaysian cultural icons - Bicycle rickshaws and Nasi Lemak. 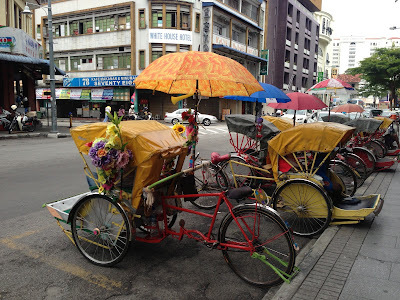 No series of posts about Malaysian cuisine could possibly neglect to mention an iconic dish that is considered so important it ranks as part of the country's national heritage no less! It is such an integral element of the national diet that recently raging controversy was sparked when well meaning health experts dared to suggest that it's place on school and college menus should be curtailed due to the increasing obesity problem slowly becoming evident among pupils and students around the country. When I'm visiting my family there however, I eat it so often that I take it for granted and almost forget to talk about it or that it is worthy of a post all to itself! 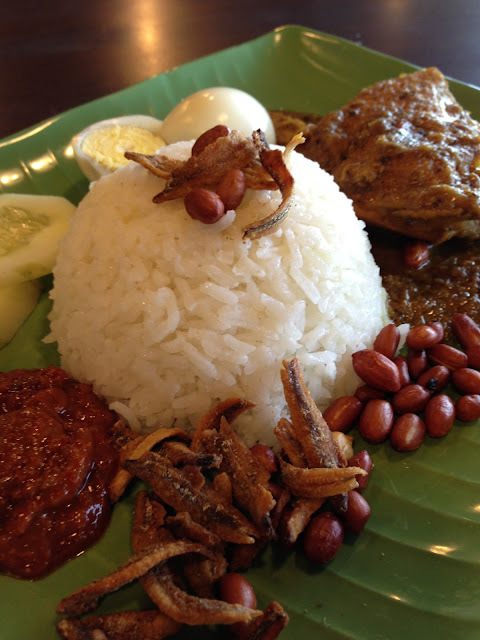 Nasi Lemak is a dish eaten in Malaysia, Brunei, Singapore, the Riau Islands and Southern Thailand. It is rooted in Malay culture and the name literally means "Fatty Rice" derived from the cooking process whereby rice is soaked in coconut cream and then the mixture is steamed. Sometimes knotted screwpine (pandan) leaves are thrown into the rice while steaming to give it more fragrance. Aromatics such as ginger and lemon grass may also be added for enhanced fragrance. Because of it's versatility it is now served and eaten at any time of the day. Traditionally the dish comes as a platter of food wrapped in a banana leaf with cucumber slices, small dried anchovies (ikan bilis), roasted peanuts, cucumber, hard boiled egg, and the all important spicy sauce (sambal). To make the dish more substantial and upmarket chicken, cuttlefish, cockles, pickled vegetables and beef rendang can be added. Rice: Wash rice in cold water and drain. Put into rice cooker Add all the "Rice" ingredients. Cook for 30 minutes until soft. Sambal: Heat oil in a wok add blended ingredients until oil separates (about 5 minutes) Add tamarind juice and cook for a further two minutes. Add Ikan bilis and onion slices. Finally add salt and sugar to taste and simmer for a further two minutes. Assemble the rice Sambal and condiments as per the photograph. Enjoy...!